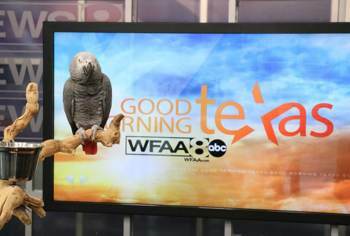 Einstein the Talking Texan Parrot - Super Star! There are two other African Grey parrots that are famous. One of them appeared on Animal Planet in 2006 and won the title of “Pet Star”. The other, Alex the African Grey Parrot, tragically passed away in 2007. Alex was once called, the "Einstein" of Parrots for a very good reason! He and Irene Pepperberg pioneering work changed the worlds views on the cognitive abilities of birds and animal intelligence. We are three very different parrots who are unique in our own way. Read here about the three of us and I hope to avoid any further confusion. Here is a list of accomplishments that I'm really proud of! Let me tell you about them! Between November 2016 and March 2017, my voice is being heard at the Cneai= Museum near Paris France. Read all about it here. On February 18, 2016 I was invited by The Wings of Love Bird Haven to appear with them on the the TV show, Good Morning Texas! It was a wonderful and fun experience! The 5 minute segment can be viewed here. Read my Blog post for the whole story! In Europe and Asia I was seen in a show called "Pets Make You Laugh Out Loud 2" on Nat Geo Wild. The show aired in September of 2015 and featured me performing my Matthew McConaughey impersonation. The segment showed other talking parrots and demonstrated how funny talking birds can be. My Matthew McConaughey impersonation got some air time in the US on August 4, 2015. It was on an episode of truTV's Top Funniest. 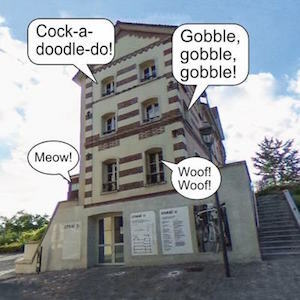 The title of the episode is “You've Got Fail” (Season 3, Episode 21) The segment of the show featured many different animal that performed funny impersonations. The show is available on iTunes if you care to download it. On January 15, 2015 Marcia and I had an online interview with Talk Center America. The show was about exotic pets. There were also a few skunks, a hedgehog, ferret, snakes, and a cockatoo on the show. I recommend watching the whole thing, but if you want to skip to the parts with me, here are the time stamps. 5:25 I say "God Bless You"
48:31 May/December romance - Snowy and I? The show was fast paced, and you never knew what the host would ask or when they would put you on camera. All in all it was fun, and I enjoyed it, hope you do too! November 13, 2014 will be a day I will never forget. I woke up to an email inbox bursting full of messages! It seemed the YouTube video of my Matthew McConaughey impersonation had been discovered by all the major TV and radio stations. Everyone was talking about ME! You can go to my blog post where I have clips from ABC, CBS, NBC, and FOX. The CBC Radio Show, “As It Happens” did a phone interview with Marcia too! This happened the same week that Mr. McConaughey received his Star on the Hollywood Walk of Fame. Many had the opinion I upstaged Mr. McConaughey! Watch as Einstein thinks Matthew McConaughey is Alright! on YouTube! Einstein watched as Matthew McConaughey accepted his Academy Award for his performance in Dallas Buyers Club. It's ALRIGHT! Here he performs a Matthew McConaughey impersonation. It should not be easy to live everyday with Einstein! Companion of a family of Texas in the United States, this gray Congo parrot is as blah-blah! It does not stop the day! In 17 years, he developed a vocabulary of madness! Einstein has learned to pronounce 137 words, 106 sentences and 28 sound imitations! Siren, phone ringing, gobble of turkey, crowing, neighing of a horse! ... Crazy! ça ne doit pas étre facile de vivre au quotidien avec Einstein! Compagnon d'une familie du Texas, aux états-unis, ce perroquet gris du congo est un as du blah-bla! Il n'arrète pas de la journée! En 17 ans, il développé un vocabulaire de folie! Einstein a ainsi appris a prononcer 137 mots, 106 phrases et é imiter 28 sons! Sirene, sonnerie de teléphone, cir du dindon, chant du coq, hennissement du cheval!... Crazy! I was humbled and honored when the Grey Parrot Studios asked for me send them video of me talking to be in a DVD they were producing about Alex. 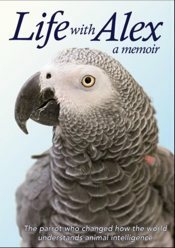 This DVD is about how Alex the African Grey that lived, worked, and played at Brandeis University. It's because of Alex that we now have better understanding of avian intelligence and learning. After the release of the DVD in September 2012, I was asked to write a review and you can read it here: A Review: Life with Alex, a memoir. 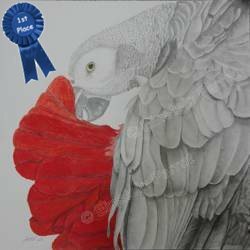 Portrait of Einstein wins 1st Place at the State Fair of Texas! Barbara visited Einstein in the Summer of 2011 with a film crew to take video for a new DVD, "Train Your Parrot To Talk." 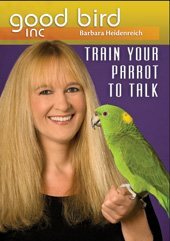 In the DVD, Barbara Heidenreich, a professional animal trainer will teach you the steps to train your parrot to talk. She talks about the myths associated with talking parrots and discusses which birds are candidates for talking. She explains the best ways to expose your parrot to sounds you want them to repeat, methods for encouraging your parrot to talk, and teaching them to talk on cue. Purchase the DVD at the Good Bird Inc. online store. Einstein Fan Discount! 10% off! Use the Special Code "Einstein" in your Shopping Cart at Check Out. Watch what happens "behind the scenes" while making the DVD with Einstein! In August of 2011, I was featured on Tubefilter, a weekly video blog hosted by Marc Hustvedt on YouTube. He had many fine things to say about me and even said I was "in an elite league of super cognitive talking parrots." WOW! Watch the video below, I'm featured in his first story! This story appeared in the August 8, 2010 issue of Real People Magazine. Funny how a magazine named "Real People" wrote an article about a Talking PARROT! The story is a funny anecdote of when I said my first words at Thanksgiving 1998! Real People is a Magazine found only in the United Kingdom, but read the article here! In the Spring of 2008 Barbara Heidenreich of Good Bird Inc. came for a visit and interviewed Einstein for a podcast! Listen to Einstein's interview with Barbara Heidenreich on Pet Life Radio. Scroll down to Episode 23 - "Einstein", and then click on "Listen Now". The Podcast is about 25 minutes long.